LS Quarry is committed to establishing and maintaining a team environment in which every member of the workforce produces quality work, safely and efficiently and where equipment performance and production is optimized. An integral part of achieving this objective is ensuring that our team have the training they need to attain these goals. We pride ourselves on helping our team realize their career aspirations and be the best that they can be. within our Maintenance team. Both are local boys who have a clear passion for, and commitment to the Quarry industry. Our school based apprentice is completing a Certificate III in Mobile Plant Technology. He works ‘hands on’ one day per week alongside our most experienced tradesmen and attends TAFE for theoretical training on a regular basis. 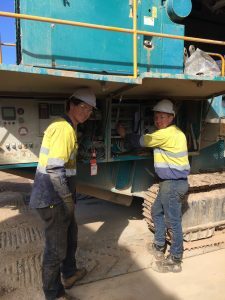 Our second apprentice had already attained a Certificate III in Light Vehicle Mechanical Technology prior to being employed at LS Quarry and since starting with us, has also enrolled in the Certificate III in Mobile Plant Technology.